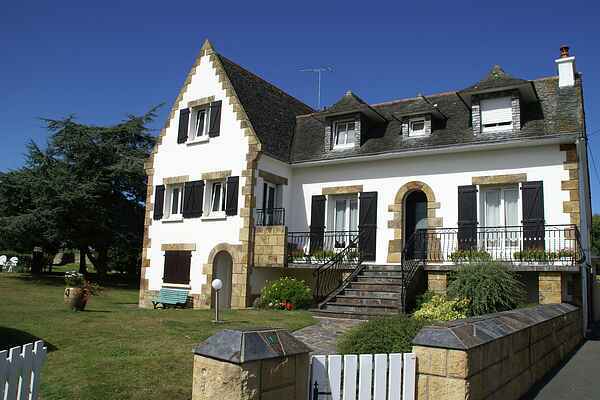 Distinctive, Breton holiday home, just 800 m from the beach. Bakery, supermarket, and greengrocer are just a stone's throw away (50 m). The spacious garden is practically a paradise for the kids to play in. For kicking a ball, or just running, around, this 2500 m2 area is perfect. There's also a vegetable garden full of fresh herbs. Take a walk along the beach toward the Sillon de Talbert headland. This strip of sand and pebbles extends 3 km out into the sea. Here you'll find a small church, a lighthouse, and a stunning view of the ocean. You'll have access to 4 bicycles (2 mountain bikes and 2 ladies' bikes). Along the coastal road, you can make some great trips along the Côte d'Armor. Sailboat and surfboard rentals are available at the beach in Lézardrieux (9 km). And there are bike rentals and mini golf in Pleubian (3 km). Internet connection available at the little bar, 50 m away. A quick drive can take you to the Château de la Roche Jagu in Pleudaniel (18 km) or the pink granite coast of Perros-Guirec (30 km). From here you can catch a ferry to Les Sept Iles, the seven islands, which lie along the coastline. Swimming pools in both Paimpol and Tregueir (15 km).